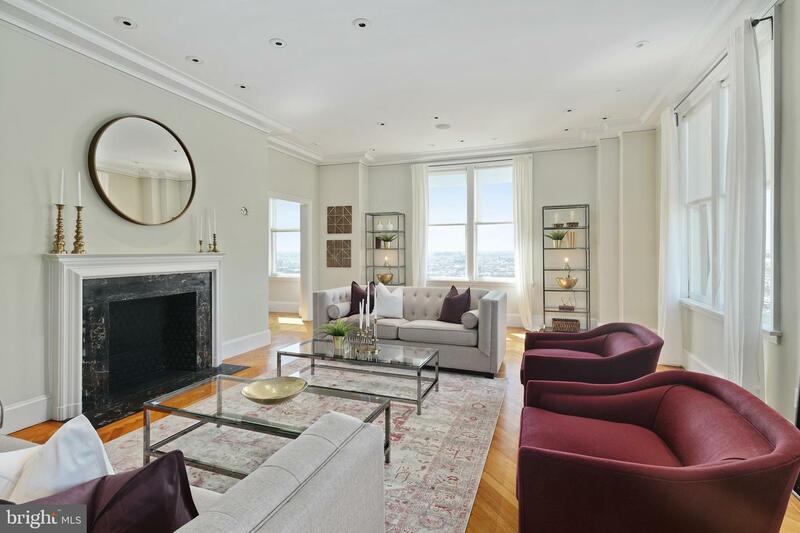 Located directly on Rittenhouse Square in The Barclay Condominium, this stunning residence blends modern updates with restored original details. Condominium 16B is a corner three bedroom plus den, three and a half bathroom with unobstructed Rittenhouse Square views to the west and sun-filled views of the city to the south. There is a grand gallery running the length of the home with 10' ceilings. A large living room, library/den with wet bar and bedroom suite all offer direct views onto Rittenhouse Square. On the other side of the living room is a sun-soaked formal dining room which leads into the chef's kitchen. The Bulthaup designed kitchen features custom cabinetry, granite countertops, a huge center island with breakfast bar, and high-end appliances including a Sub-Zero refrigerator/freezer, two Miele dishwashers, and Gaggenau wall ovens. The entire rear of the condominium is a lavish master suite boasting his and hers bathrooms and an entire dressing room. Additional home highlights include an additional bedroom, powder room and laundry room. No detail has been left undone in this one-of-a-kind residence--all moldings, millwork, flooring, lighting and built-ins are beautifully designed and customized for this home.